During the WW II he fled to India, after escaping from prison, where he and three of his LSSP colleagues had been imprisoned for so-called anti-war activities. In India they became part of the Bolshevik-Leninist Party of India, Ceylon and Burma. After the war he returned to Ceylon and became the first leader of the Bolshevik Samasamaja Party. In 1947 he [Wellawatte-Galkissa] was one of five party candidates who were elected to parliament. After the reunification of LSSP and Bolshevik Samasamajists, de Silva became a key leader of LSSP. Colvin R de Silva, a multi-dimensional figure was born 113 years ago in Ambalangoda. He had his preliminary education at St John’s College, Panadura, before entering Royal College, Colombo. He was island’s number one criminal lawyer in 1940s - 1960s, who strongly opposed the Capital Punishment. His usual appearance was for defense in murder cases. Obviously he knew he could earn an enhanced fee only if the Capital Punishment was continued, but our humanist stuck to principles. Politics and law are two well intermingled fields; It is very hard to distinguish between them, especially in Sri Lankan context. Quite a few of our politicians past and present are with a legal background. There are Politico-Lawyers and Lawyer Politicians and, like in cricketing parlour, where they classify all-rounders as ‘Bowling all-rounders’ and 'Batting all-rounders’. But Colvin was unique, for he excelled evenly authoritative in both these ‘crafts’. Further he outshined all his politico-legal colleagues of the day. In courts, he enjoyed an unmatched reputation as a criminal lawyer of great distinction. He became visible in virtually every high-profile criminal case in the 1940s to 70s period. In Sathasivam wife murder case, his remarkably brilliant cross-examining talents resulted in the acquittal of world famous cricketer who murdered his wife. In the Kularatne wife Murder case too, it was his remarkable knowledge of the law of circumstantial evidence that freed the accused Dr. Kularatne. 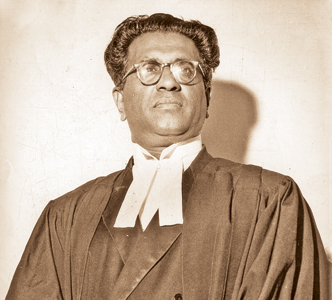 Dr. Colvin R de Silva appeared in many FR cases before the SC, with the introduction of Fundamental Rights litigation. “Whenever the state of Lanka was divided into parts and sub kings were appointed to them under the control of one emperor, enemies here and abroad exploited such divisions to put one against the other. The final result of such hostile strategies was the loss of our very freedom to foreigners. The people of this country know this and I do not believe that they would be prepared, even for a moment to do away with this unitary character of this country,” he continued. “From the time we can remember this country always had a unitary government ..... This is a small country....... The damage that could result to this small nation living in this small country by dividing it into several units is demonstrated in our history." In 1925, he boxed for Royal College along with his classmate and later political foe J R Jayewardene, the two met in the boxing ring in an inter-house bout. In an unprecedented move when President JRJ banned May Day rallies in 1987; age did not deter Colvin the revolutionist from defying emergency regulations and lead from the front, the LSSP demonstration at Union Place; but, had to be hospitalized when a tear gas canister hit him in the leg. Next morning photographs of JR talking to his former classmate at the hospital bed appeared in all newspapers, but they did not say what the two octogenarian politicians discussed— was it Politics, Boxing or…? The legacy left behind by Colvin in a five and half decades of revolutionary thoughts and legal opinions, most of which are applicable and valid and even more significantly in today’s volatile political atmosphere. The truth however is that the LSSP campaigned vigorously against the Official Language Bill and that was mainly because at that time they enjoyed a lion’s share of estate Tamil vote which was concentrated around the LSSP and they had a strong LSSP wing in Jaffna too. This wing of Jaffna in fact was the only non-racial political party that existed in Jaffna but it eventually succumbed to Chelvanayagam’s racialist offensive at the time. Colvin R De Silva who was responsible on behalf of LSSP for the liaisons with the 4th International, was elected to its International Executive Committee, a position he held until the LSSP was expelled from the International, when in 1964, though de Silva fought against the LSSP joining the ‘capitalists’ Sirimavo government, but unlike few others who stood by that line he went with majority and stayed in the party. That was the beginning of the fall of the oldest existing political party in the island. Thus, by the mid-60s the LSSP changed their policies and joined hands with Sirimavo accepting its ‘progressive’ policies. 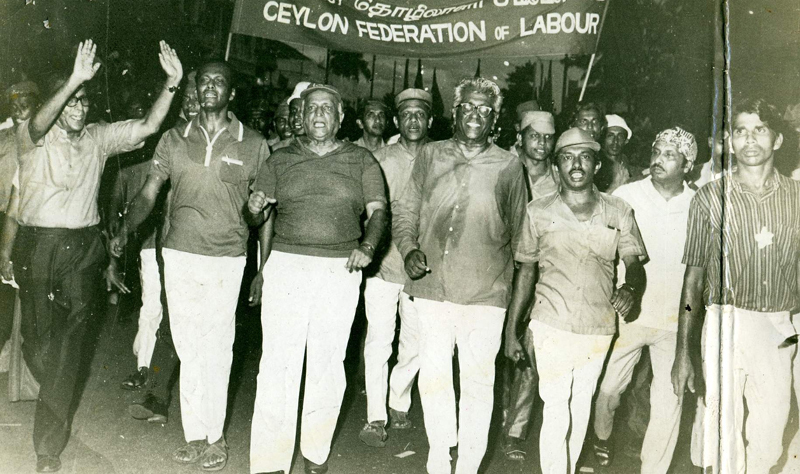 Then in 1966, when the racialist SLFP led coalition staged their protest campaign against the Dudley-Chelvanayagam Pact of 1965, the LSSP was in the forefront and its party activist Ven. Dambarave Ratnasara Thera was shot by Police in an unruly demonstration at Colpetty.